New Liturgical Movement: Back to the Future? No Thanks, I've Been There! Catholic World Report probably did not envision the reaction it received when it published an article by Fr Peter Stravinskas entitled, “How the Ordinary Form of the Mass can ‘Enrich’ the Extraordinary Form.” The comments section on this opinion piece is still receiving responses. My immediate reaction when I read it was: Haven’t we been here before? Indeed, when one looks at the alterations Fr Stravinskas suggests, they’ve been done. The seven-year period before the implementation of the so-called Missa Normativa, which became the Novus Ordo Missae, had many of these revisions. As one who lived through the upheavals (and they were exactly that) of the period from 1963 to 1970, the list Fr Stravinskas enumerated seemed like a walk back to a place I’ve visited before, and don’t want to return to. Things as they were in some place, circa 1965. It brought back a kaleidoscope of memories of seemingly endless changes in the liturgy, confusion, and ultimately, a break with what was before. That was my experience during those days, and as someone who has fought for most of his adult life to see the restoration of the Traditional Mass, I am wary of any attempts to coalesce parts of the Ordinary Form into the Extraordinary Form. Of course, the changes in the liturgy began in the 1950s, with the revision of Holy Week and the first simplification of the rubrics in 1955. A further simplification occurred in 1961, leading to the publication of the 1962 Missal. Those changes in many respects set the stage for what was to follow, and those subsequent changes were the most jarring, especially after Sacrosanctum Concilium. The 1962 Missal really only lasted for a bit more than a year. In 1963, changes were promulgated that truncated the Prayers at the Foot of the Altar, and eliminated the Last Gospel. It is interesting to note, in little more than seven years, we went from particular Last Gospels on feasts to no Last Gospels. Changes were also ordered by which much of the Mass took place at the celebrant’s chair, rather than the altar. But all these were paltry compared to what was to greet churchgoers on Advent Sunday of 1965. I was an altar boy in those years when confusion reigned. My home church in New Haven, St Anthony’s, was run by the Scalabrini Fathers, who at least there were very liturgically centered. For its time, it was good parish liturgy. We had “Our Parish Prays and Sings” by St John’s Collegeville, from which we did chant Masses and learned some good hymnody, especially for the students of the school. Of course, being a Scalabrini parish, we learned some of the Masses by Fr Carlo Rossini, a member of the order who was the Director of Music at the Pittsburgh Cathedral. I still have a soft spot in my heart for the Missa Salve Regina. On that Advent Sunday, we arrived to see a portable altar put up in front of our high altar. We were prepped for the change by the sisters in the school, who told us what a great thing was going to happen, and that the liturgy was going to be more understandable and bring us more into the celebration. Words like “liturgy” became part of the language. Don’t call it “Mass” anymore. But it was not an easy roll out. A funny thing happens when you turn a sanctuary around: it’s like doing things in a mirror. Everything looks a bit familiar, but also very different. The priests at St Anthony’s had taken the changes in stride, but thought they would be an experiment, and then we’d go back to what worked. A good example of what was happening in those days is seen in a story I tell often. Fr Remegio Pigato was a jolly priest, a former rector of the Scalabrini Seminary on Staten Island, learned, humble and holy. Every day he could be seen in the church lot, walking and reading his breviary. He had the early Mass on the second Sunday of Advent, the week after everything changed. We had been attempting to get along with the new order, but things were different. Servers mixed up the Gospel side and the Epistle side, and changing the book became a problem. This time the server charged with moving it took it off the altar facing the people, came around in front, genuflected and got confused. He hesitated. Finally, he put the book on the Gospel side, but the hesitation was seen by everyone. Fr Pigato, who’d been celebrating all week and saw various servers do the same thing, could take it no longer. “Ladies and Gentlemen,” he said in his thick Italian accent, “I apologize. We are no saying the Mass backwards.” That pretty much summed up the confusion. That wasn’t the end of it. Introits, collects, the entire ordinary, and the Lord’s Prayer had been switched to English. From the Preface through the Canon, things were in Latin. The Offertory Procession was inserted into the Mass, and a commentator read us a script to let us know what was coming up. Add the Prayers of the Faithful to that, and immediately there was a different ethos. The Offertory Procession, which was supposed to show the offering of the congregation, was really just a very perfunctory event that added little to the solemnity of the Mass; if anything, it detracted from it. It was foreign, it called attention to itself. The Prayers of the Faithful, rather than being something for and by the congregation, was a scripted set of biddings with a parroted “Lord, hear our prayer” after each invocation. Already one could see that this new change was going to import something into the Mass that was very alien to Catholic worship: chatter. Everything was said aloud. Meanwhile, we were told that turning the altars would mean that we would see what the priest was doing. That was true, but the ceremonies were then pared down so much that the priest really wasn’t doing anything that needed to be seen. However, the change did alter the focus, no matter how observant the celebrant; facing the people meant engaging the people. Custody of the eyes, which had always been so important for the celebrant to focus on praying the Mass, now had been jettisoned in favor of dialogue. The last saving grace was that the Canon was still in Latin. The priest had to focus during the most important part of the Mass. We were told the Canon, that most untranslatable prayer, would never be in the vernacular because it is too steeped in meaning. In 1967, it was put in the vernacular. Concurrent with the changes in liturgy came a lessening in discipline. Many priests in many churches told people not to worry if they missed Mass, there was a new “Spirit of the Council” that was throwing off the “rigidity” of the past. Add to this the abolition of meatless Fridays as an obligation and other disciplinary strictures, and it was too much for many people. This was not what they signed up for. It is an anomaly that 1965 was the banner year for church attendance, conversions, and men and women in seminaries or religious life. A year later, at least in New Haven, there was already talk about closing schools and churches, attendance had plummeted that much. The changes were to continue. More and more vernacular came into the liturgy. Communion in the hand, standing for Communion and the demolition of sanctuaries followed, along with anticipatory Masses on Saturday. Finally, in 1970 a new order of Mass was introduced, and it was even more jarring, more opposed to what went before. By that time, church attendance at St Anthony’s and many other places had halved. The revolution of the mid- to late-1960s had upended society. 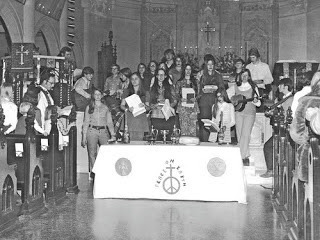 Many people who defend the liturgical changes of that era say that part of the problem was the rise of the counter-culture late in the decade, and that the Church declined because of those forces. One wonders if the changes of 1965 and later didn’t help bring about societal upheavals of 1968. I’ll leave that up to historians. Fr Stravinskas put forth proposals that go farther than what happened in 1965 or later. His are the opinions expressed by the liturgical experts of that time. The problem with many of those experts was they were not parish priests; most were university professors whose pastoral experience was, at best, limited. Their prescription for reviving Catholic practice and liturgy has been tried and found wanting. With all due deference to Fr Stravinskas, a priest whom I know and respect, what we need is a time of liturgical peace. While some feasts might be added, or some prefaces allowed, the alterations he suggests are just rehashes of ideas that were implemented and led to the Missal of Paul VI. Been there, done that. I don’t want to go back to the future. I’ve been there, and it’s not all it’s cracked up to be.